EchoSpan has integrated with Microsoft Cognitive Services to provide Sentiment Analysis of comments in PDF reports. 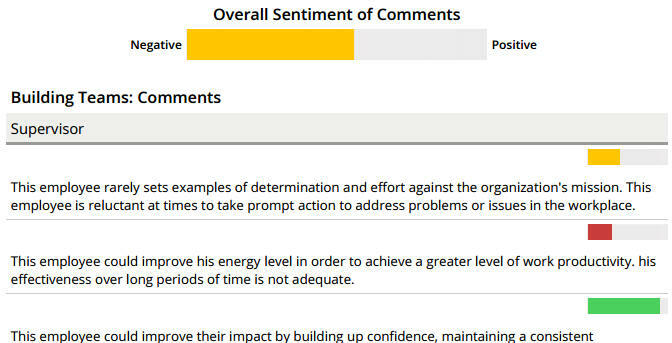 The Sentiment Analysis feature “reads” comments in reports and presents the reader with a measure of positivity for each one presented as a small graph above the comment text. Sentiment scores are useful in quickly identifying comments that may be highly positive or negative. This feature will be released initially as a publicly available beta to Professional and Enterprise Edition customers while final testing is performed. The EchoSpan mobile platform has been optimized so that the user interface for responding to reviews is more user-friendly on iPhone and Android. Users will find that the buttons and review screens are bigger and brighter and users can even utilize Apple’s voice to text feature to enter content into comment boxes. Group reports will now be queued and generated in the background with the resulting PDF emailed to you. This change allows Administrators to continue working on other tasks in the tool while generating their group reports. You can now edit the text that appears on the final, “thank you” page of a feedback review. Text can be specific to self-raters or other raters. Text is editable under the Setup >> User Screen Content menu option. You can now select to reverse the display of the rating scale order so that the values appear highest to lowest as Raters complete their reviews. The graphs in your reports will still display values from low to high. 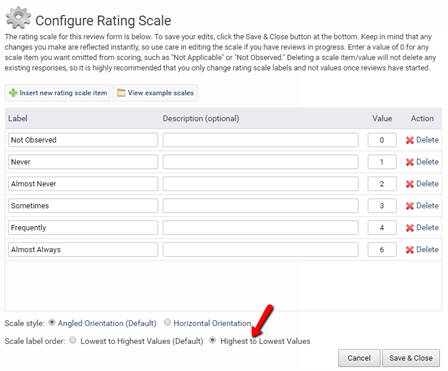 Rating scales are editable under the Setup >> Rating Scale menu option. Project administrators can now restrict printing, copying from or modifications to PDFs generated using custom report templates. 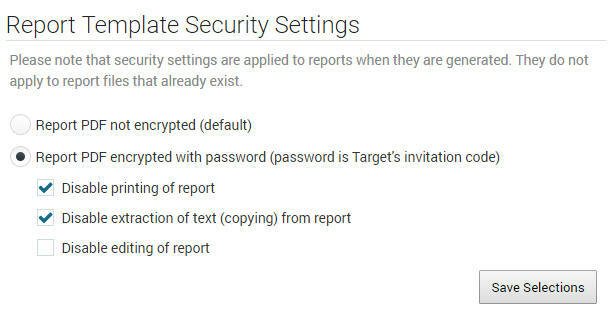 Security settings can be set specifically for each custom report template. 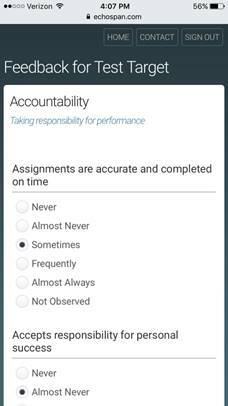 Report security options can be accessed by clicking the “Security Settings” button at the top of the Reports >> Edit Report Templates page in the administrative tool. Rater lists can now be automatically submitted to an auditor if a target fails to complete them after a preset number of days. An alert can be sent to targets when an auditor finalizes a review of his or her rater list. The Custom Benchmark feature now only lists projects that are compatible with a destination project, preventing errors from being displayed when two incompatible projects are compared. Report file names can have a custom tag or field appended to the beginning and/or end of file names. Added the ability to sort the Hidden Strengths/Blind Spots report component based on the scoring gap between the Self and All Raters score. 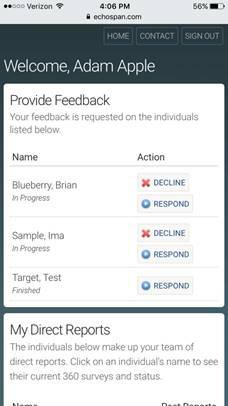 This addition will allow to you present the report with the hidden strengths and blind spots grouped together in their respective sections, making it even easier for Targets to find areas of strength and weakness in their feedback results. Users still have the option to sort the component from high to low or low to high, based on the overall score for the item. The version 7.65 update is automatically applied to any new, blank project you create. You can also update an existing project by opening the project and clicking "Upgrade Project" in the top right of the Home page if an update is available. Upgrades are available to clients without existing customizations. Note that if you clone a project that uses an older version of code, the new project will also be based on the older code and require an update. As always, we appreciate your feedback on our product and services.